Green peas are wonder legume! !tenderly fresh winter crop and are in season now.I make best use of peas when in season! !once they are off the season they become overpriced and at-times mostly unavailable(fresh peas are always a treasure).Love its presence in most dishes I make!as it has its own natural exclusive essence.It was a remarkable cold evening!drizzling outside when I made this pea soup recipe for my kiddies. It came out as creamy,delicate and pale green soup!served them hot with little fresh cream on top and some croutons.If you prefer to have thinner sauce you can add more milk.It is one of the healthy recipes with peas that our kids will surely like it!one of the winter specialty.While preparing white sauce stir constantly otherwise will form lumps or can use a blender to prevent lumps. 1.Melt butter in a pan and add maida,stir for a minute without browning. 2.Switch off the stove and blend milk little by little without lumps. 3.Turn on the stove and stir till it thickens,then add salt and pepper as per taste and switch off(transfer to a bowl). 1.Boil 2 cups of water in a pan and add peas,onion to it and let it boil for 5-8 minutes. 2.Then when cool grind smoothly with salt added(for vegetable). 3.Strain it and mix it with the white sauce and bring it to boil till rawness goes off(2-3 minutes). 4.Serve immediately topping with fresh cream(can add pepper when serving its optional). Melt butter in a pan and add maida,stir for a minute without browning. Switch off the stove and blend milk little by little without lumps. Turn on the stove and stir till it thickens,then add salt and pepper as per taste and switch off(transfer to a bowl). Boil 2 cups of water in a pan and add peas,onion to it and let it boil for 5-8 minutes. Then when cool grind smoothly with salt added(for vegetable). Strain it and mix it with the white sauce and bring it to boil till rawness goes off(2-3 minutes). Serve immediately topping with fresh cream(can add pepper when serving its optional). For thick white sauce you have to reduce the milk quantity and thinner sauce you have to add more milk. Finally check for salt and pepper and adjust accordingly. When you are preparing white sauce if it is lumpy can use blender to get a smooth sauce(easy way to get rid of lumps). The color will change if we boil the soup for longer time and taste also changes. 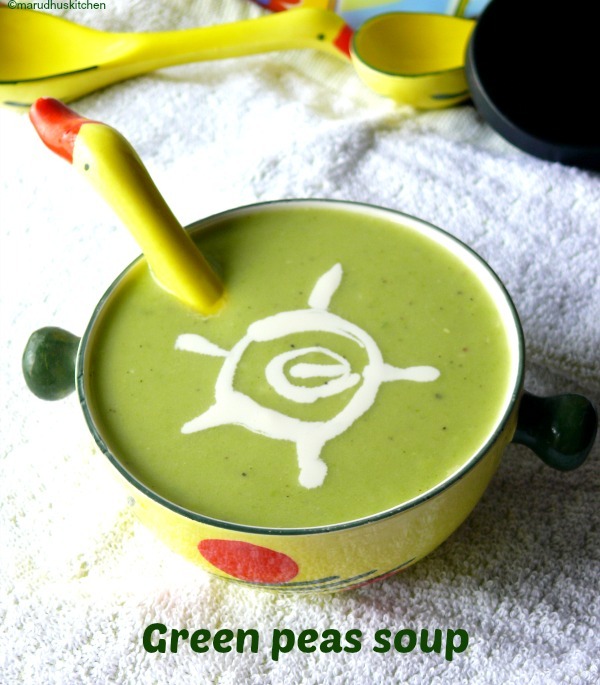 Thanks vani for sharing very good peas soup recipe. Looking very tempting with best clicked images. 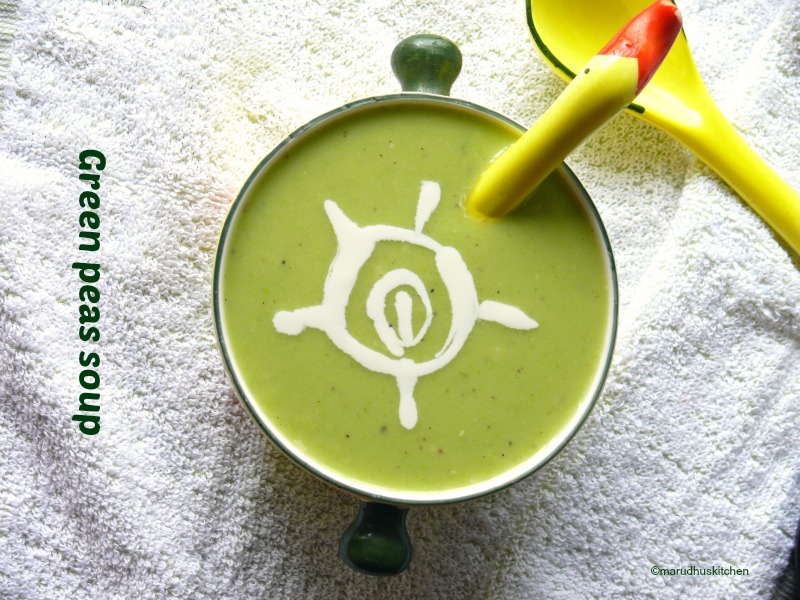 Peas is excellent source of fiber and protein, and this soup recipe is must for this winter season. Healthy soup.. Good for this season.. Liked the presentation too. healthy and yummy soup!! love the color! !